NewToBC | Creating awareness of Libraries and Settlement Services for Newcomers to BC. Creating awareness of Libraries and Settlement Services for Newcomers to BC. This year has been a tough one. We have watched and listened to a rise in racist discourse, seeing attacks on immigrants and ethnic minorities following this year’s Brexit vote in Britain, and the recent election campaign in the United States. Aleppo has fallen. The future is concerning. And yet, there has been much goodness countering the seeming decline in humanity. 37,402 refugees were resettled in Canada in 2016. Public outrage, following the photo of Alan Kurdi, the three-year-old boy who drowned in the Mediterranean Sea trying to reach Europe, sparked action to private sponsorship of refugees to Canada. This allowed for more refugees to come than would otherwise be possible through government sponsorship programs. News outlets showed Canadians welcoming refugees with open hearts and homes. Is this a perfect world? No. Many people who have left their families will find this season difficult. But, perhaps, our open hearts and homes will lead us to a more optimistic 2017. From our hearts to yours. Merry Christmas. What excites you most about your new role as Chief Librarian? The opportunity to make positive change in people’s lives and to guide the future of the library in an incredibly rapidly growing city. Tell me what your vision is for the future of the Surrey Libraries. That there is a library in every neighbourhood in Surrey and that the library is the first place Surrey residents think of when they want to learn something new or get to know their neighbourhood. What do you feel is the most underutilized resource of the library? Overall I feel there is a general lack of awareness of what public libraries offer. Many newcomers do not realize the amazing array of resources or assistance available for free at their local library. And many long time residents or Canadians still have traditional notions of a library. Libraries are not just about books, they are thriving community centres where one can meet people, learn a new skill or be introduced to new ideas. So I think libraries overall are under utilized and one of my goals is to spread the word….which the Library Champions project does so well! What is the biggest challenge that Surrey Libraries are facing? Keeping pace with the rapid growth in the city. Over 1000 people move to Surrey each month. Surrey is geographically huge – the size of Vancouver, Richmond & Burnaby combined, and our 9 branches are located in the town centres; however, there are many neighbourhoods that are not close to a library. Transit is not adequate, so I think we are not able to reach many people who could benefit from our services. Tell me your thoughts on the Library Champions Project. I am impressed by the project and the dedication of the facilitators – Branka in Surrey, as well as the staff; and of course the champions themselves who make the project a success. I’m thrilled the project has been expanded to other libraries. Have you had the opportunity to work with this project? Yes, I participated in the steering committee for a while. I helped interview a round of champions for Surrey, and have also participated in the local wrap up events as well as the annual celebration. What impact did this project make on you personally, as well as on your libraries? I have been touched by the many stories shared by the champions….stories of struggle and hope. It reminds me of my first year in Canada – over 20 years ago now. At one session a Syrian couple who had just been in the country for 2 weeks came to volunteer. We see many people very new to the country wanting to participate and I’m always impressed by their courage. With Surrey being a destination for many newcomers, the project has been terrific for our community…one of the champions was hired for a position at the library. One champion sits on an advisory committee for the Surrey Local Immigration Partnership. What recommendations do you have for newcomers coming to your library? If you don’t immediately see what you need, or are unsure where to start, ask staff for help. You are not disturbing staff – that is what they are there for! Participate in the wide range of free programs, e.g. Our ESL Book Clubs are a great way to make friends. Or if you bring your children to a story time, stay afterwards to chat with the other mums. It’s a good way to build bonds in the community. What surprises you most about your library? That so many people are still unaware of what the library offers….we need to do a better job of reaching out. What do you love most about Surrey? The library works together with many community partners. People are collaborative and sincerely want to make a difference. Our library staff are friendly and caring. I love that Surrey is diverse, dynamic and growing. There is so much opportunity and potential. Tell me something about yourself that others might not know about you. I have a sense of adventure and enjoy trying new experiences…I’ve jumped out of a plane (with a parachute) for charity, I enjoy snowboarding, and intend to learn how to ride a motorbike at some point in my life! What we take for granted in our public libraries offers richness for newcomers. Our libraries provide a welcoming community full of resources: books in multiple languages, workshops, and programs for adults, youth and children, that are accessible to everyone. Edith, who moved to New Westminster from Uganda, discovered the Library Champions Project. She learned, intimately, the services and resources in our libraries and shared her knowledge with other newcomers. Her experience with this project has helped her become more confident and realize the richness of our public libraries in BC. Tell me about your experience as a Library Champion? It was such a wonderful experience. I got to meet a lot of people from different backgrounds. I made friends and shared ideas with people whom we had similar experiences and who were looking to move forward as I was. What was the most memorable moment for you in this project? My most memorable moment was when I met two sisters who had just moved to New Westminster and lived close to the library. They did not know that the library had such good services along with access to other services – and that everything was free. Helping them get their library cards, and seeing how happy they were, put a smile on my face. Tell me about the Library you volunteered at? I volunteered at the New Westminster Public Library main branch. What I love about this library is the friendly people who work here, and its location. It’s easily accessible by transit in all directions. What do you find most surprising about Libraries here? Everyone can access the library and its services regardless of their level of education. Libraries have a lot of programs – from conversation circles for adults, to programs for kids. In addition, there are many events that pop up throughout the year. Most surprising is that libraries have a section specifically designed for kids. It is very impressive and thoughtful of those who started it. What is the best program or service that you have discovered at your library? The Reading Club for kids and the free access to the Internet. Tell me about libraries from your home country? They are basically built on schools and universities for academic purposes only, not the way it is here. Here, you find public libraries in every city that offer not only books, but the internet, baby time programs, and connection to other community services. What is your favourite place here in the lower mainland? New Westminster. The people here are super friendly. It is the first place I came to when I arrived in Canada and I was warmly welcomed, so I have an attachment. My favourite spot is Moody Park where I met with other newcomers and made new friends when I took my kids to play. Have you participated in any other service organization here? Yes I had settlement programs, job search and help with filing my taxes from ISSofBC and MOSAIC respectively. What I liked most about these two organizations was the welcoming and inclusive atmosphere they showed me. I participated in programs such as the volunteer connections program in my preparation for the job search. What has been your biggest “a-ha” moment since moving here? When I go out in the community and realize how many friends I have made here, it’s such a-ha moment. What would you tell others about the Library Champions Project? This program helps you meet with people from different backgrounds – I was able to learn more on how things work in the other parts of the world. It’s good for those looking to boost their speaking and listening skills in English and newcomers can use it on their resumes as a Canadian volunteer experience. As a volunteer in this program, you get to build lasting relationships with your library, fellow champions and the organizers. For me, particularly, I had the opportunity to meet Branka, the facilitator of this program. She was very helpful and still is – I would email her and ask questions when I wasn’t sure about something, and she was always ready to reply and give support, making this program a success for me. What was your biggest surprise in moving here? My biggest surprise has been how the weather changes so fast and the daylight savings time. It stays light when it’s evening during summer, and gets darker when it’s still day time during winter. Tell me how you discovered the Library Champions project? I was looking for a job when I arrived in BC last February and also trying to make use of my time. I did not have much of a connection with people or organizations here. My family came earlier and my wife was a former Library Champion. She encouraged me to be a volunteer with Library Champions Project and do some community work. She also provided information on the project and took me to the Surrey Library, Central Branch, on occasion, where I had opportunity to meet some Library Champions and organizers. This encouraged me to join the project. What did you enjoy most about this volunteer opportunity? I enjoyed the multi-cultural and multi lingual group in the training / workshop sessions to communicate and then developed friendship and shared ideas. I also enjoyed the smiles of the people in the community when they get to know how easy it is to access all of the information about their settlement in this new land. What was the most exciting thing to learn about your library? In my county the library is mainly academic with thousand of books only for study purpose. Here I learned and observed the multiple functions of library, including entertainment; there is something for all ages, computer use and learning opportunities, language learning and books of multiple languages. Moreover, the Library Champions Project, that disseminates information and encourages newcomer communities to use library facilities. I have visited many countries but never seen such an innovative project. Tell me about your decision to move to Canada? Initially I did not think about moving to Canada, but my son’s admission to Simon Fraser University (SFU) changed that. I realized that both my son and daughter would be able to do their studies in a better environment – the quality of education in my country is not as good as Canada. This decision was further accelerated by my country’s political situation and social insecurity. What do you love most about your new home? I love less crowded environment, the friendly people and the multiple cultures. This also gives me opportunity to learn more about other cultures and tolerance. The natural surroundings are also very fresh and green in BC. What do you miss about Bangladesh? I miss almost everything – my extended family, friends and neighbors, and fellow colleagues. I was directly able to contribute to the development of the county and community. I miss hearing Bangla (Bengali language is the 7th most spoken language in the world) almost everywhere – in different cultural functions, songs and literature etc. I miss travelling to the country and regions. Tell me about the career you had in Bangladesh? I was involved in the development sector of Bangladesh and worked with different international development organizations. I have been working as an International Civil Servant (ICS) and served as a senior officer in United Nations Population Fund (UNFPA) for about 18 years before my new life in Canada. I was able to mobilize several multi-million dollar projects through this organization and contributed to the development of the country. I have closely worked with Government and Non-Government Organizations (NGOs) including CSO / CBOs. What was your best accomplishment in your last career? My best accomplishment was the project for development of urban and rural underserved and out of reach adolescents and youth with health, education and self-reliance / livelihood. The project had demonstrated several successful innovative approaches to reach young people. These approaches are still being practiced in Bangladesh by Government and NGOs. I was able to reach more than a million of young people through that project. Are you pursuing the same career here? I have expertise in several areas such as project planning, capacity development, and monitoring and evaluation – particularly in health and population sector. I am trying to pursue same or similar career but am finding it challenging. The skills I have and the skills required are not adequately matching. Canada does not adequately recognize the University degrees and the degrees we have are not similar to their requirements. However, I am hopeful, that I will get something to work with. What organizations have you used to help you understand the job search in Canada? I am mostly using different websites. In addition I am using library and also registered with WorkBC. They are assisting me in searching for work. Recently I joined with DiverseCity as a volunteer and they are also trying to help. What suggestions do you have for others who are pursuing the same career? I would suggest the newcomers to use the Library. That provides several opportunities including free use of computer with internet and many other facilities such as printing, scanning documents and often organize information session or workshops for different target groups which are really useful. What would you tell someone who is considering to become a Library Champion? This is a great project and wonderful people to work with and learn new things, also a good opportunity to network with others. I am sure everybody will be benefited from the project who wants be involved. I would like to thank Branka, Ravi and Naomi for their amazing way of facilitation and active support during the Library Champions Program and last but not the least, my wife Syeda for introducing me with this fascinating project. From Biomedical Engineer to Library Champion. Meet Sanam. I received my Bachelor of Science in Biomedical engineering in 2014 and, just two days after graduation, I moved to Vancouver from Iran. While I was a university student, I worked at a medical equipment company while studying. I also volunteered at one of the most respected hospitals in Tehran. You might assume I continued my education in the Biomedical field. But I did NOT! I decided to start something very different rather than my background, but something that I really love. If you have ever read The Road Not Taken by Robert Frost, you will know what I mean: I decided to become a librarian and I am now enrolled in the Library and Information Technology program. I am working part-time and volunteering for the Canadian Red Cross and my local library. I want to be a librarian one day in order to fulfill my dream of making libraries a place to gather people of various backgrounds and cultures, and to assist them in accessing and using the information they need. Nothing in this world makes me happier than helping other people. Local libraries are one of my favourite places to spend time. In one of my visits to North Vancouver City Library I came across a Library Champions Project banner near the front desk, and I signed up for the information session right away. In my country, libraries are usually serious places for studying. People are not allowed to talk together in study areas and I have not seen anything there but books. Libraries here are very different from what we have in our country. For example, the North Vancouver City Library has a Seed Club – you can get your favourite seeds, free of charge, and grow your own food. This was absolutely surprising to me. The only thing that is pretty much the same between libraries in Iran and libraries here are the reading clubs where folks get together to talk about a specific book or a topic. I enjoyed every moment of the Library Champions Project. I made new friends and connections, but the best part of this for me was meeting Helene Rasmussen, the facilitator of the project. She is very caring and inspiring, and I will not forget her. In March 2016, I became aware of the Library Small Grants program through Cara Pryor, Head of Community, Program and Service Development at North Vancouver City Library. She suggested that I apply for this grant with the purpose of building cross-cultural connections in the community through the library. My project was to create a craft event at the library to bring newcomers and long-term residents together. The selection committee chose my proposal. They liked it so much that they asked me to host my event twice to give more people the opportunity to participate. This resulted in double the amount of grant funds requested. I have visited many libraries in the Lower Mainland, and I have to say the West Vancouver Memorial Library is my favorite. I love this library because it is very close to where I live, it has a beautiful patio that you can hang out with your friends, and it has Monday Movie Nights where Friends of Library serve you with fancy water and popcorn! Isn’t it great? There is also an ESL class at this library called Let’s Talk! and I am a HUGE fan of this class. The West Vancouver Memorial Library staffs are super friendly. are the Vancouver Art Gallery, Horseshoe Bay, Gastown, Deep Cove, English Bay, and the Capilano Suspension Bridge for Canyon Lights. I love cats, playing the piano and reading books. I love sushi rolls and I think Vancouver is the place to be for this. 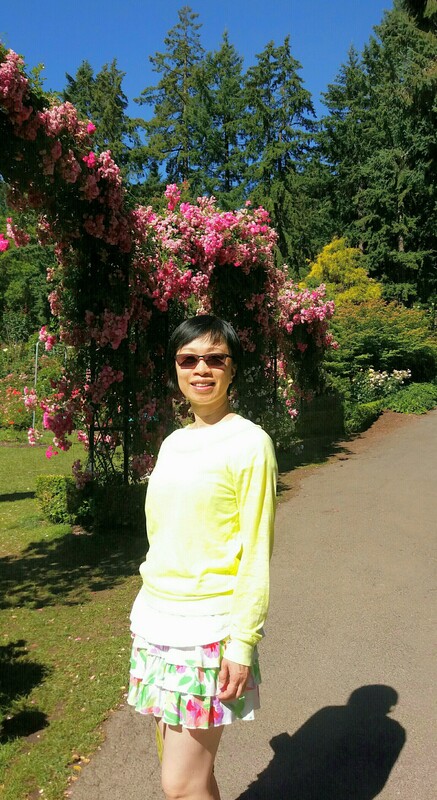 From Hong Kong to Vancouver, Grace became a Library Champion. She heard about this volunteer opportunity through a friend who had participated in this project. After completing her Library Champion volunteer opportunity, she moved on to become a member of the Library Champion Advisory Committee where she assists in planning the year end Library Champion celebration and provides feedback to the project to help move it forward and reach more newcomers moving to BC. What do you love most about being on the LCP Advisory? It’s a great opportunity to meet Library Champions from different districts and learn from each other in event planning and project organization. I love brainstorming on what we could do more for the Library Champions Project, to meet the expectation of participants and spread the word to potential participants. What do you like most about Libraries in BC? Libraries in BC have a very good system: we can borrow a book from one library and return it to another, there are many magazines in Chinese language so I never miss any current news from my hometown, and when I need an answer for my question, librarians are there to assist. How did you discover the Library Champions Project? My friend participated in the Library Champion Project and told me about his experience and encouraged me to join. What do you enjoy most about this project? I loved the tour of the library – I learned about the design of the library and the categorization of books, as well as the many resources and facilities available at the library. What surprised you the most about your new country? Many people find jobs through connections, but not from the advertisement – networking is extremely important. Why did you choose the Lower Mainland? I chose it because of the mild weather, its beautiful nature, and friendly people. What more can you ask for? What do you feel newcomers should know about their libraries? BC libraries not only have books, newspapers, and videos, they also have job search information, children’s story time, book club, talks and much more. If newcomers visit libraries often, they can find out the latest events and activities. What service offered at your local library surprised you the most? I was happy to see that the libraries have newspapers from so many countries. Readers can enjoy reading newspapers from their own hometown. Tell me about the libraries where you are from? How are they different / the same? Librarians are very helpful in both cities, but I was surprised that the central library in Hong Kong is not as big as the central library in downtown Vancouver. The libraries in the lower mainland have a lot of new books, events and activities. What has been your biggest challenge about living here? My biggest challenge is learning driving. I have a bad sense of direction. What has been your biggest win since moving here? I completed my yoga teacher certificate in Vancouver. I enjoy my full time job in providing services to newcomers and part time job as a yoga teacher. What is your favourite food dish? I love a good lobster and steak. What do you miss the most about your previous home? I miss getting together with friends and relatives more than anything. What is your favourite activity here in the lower mainland? I enjoy both indoor and outdoor activities. I love yoga, reading, hiking, and running marathons. Eleven library systems in thirteen communities across the Metro Vancouver area support NewToBC by raising awareness about project services by hosting cycles of the Library Champions project, and by participating as members of the NewToBC Steering Committee. Members of the Steering Committee bring their libraries’ perspectives as well as a wealth of experience, insight, creativity and passion to the planning of NewToBC activities and services. Over the years, the Steering Committee has guided the transformation of NewToBC from an idea into a pilot project and, now, into an expansive and successful library settlement initiative. The NewToBC Steering Committee is made up of chief librarians, directors, coordinators and other administrators from each of the eleven public library systems. It is currently undergoing a period of renewal. A number of long term members of the committee are moving on due to retirement, to a change in their role or position, or to change in their employment. NewToBC is enormously grateful for the contributions of all of the members of the Steering Committee. We would like to take this opportunity to express our appreciation of the outgoing members. Without your input, support and insight, this project would not have attained its current success. Shelagh Flaherty (Director of Library Experience, Vancouver Public Library). As NewToBC continues to grow and to evolve, we will continue to call upon the members of the Steering Committee to provide input into and to serve as champions of the project. NewToBC would like to welcome the following new members to the Steering Committee. Dawn Ibey (Acting Director of Library Experience, Vancouver Public Library). We are excited to build on the foundation of the outgoing Steering Committee members adding new, fresh perspectives of the incoming members.